I visited the north western mountain flank crater, Crater I, on Shiretokoiozan Volcano on the first day of mission 15. Crater I expelled 116,523 tons of molten sulfur in 1936 and the liquid sulfur flowed into Kamuiwakka Creek located nearby and flowed for 1.5 km. Shortly after the eruption almost all the sulfur was mined and taken away as resources. The first thing I checked was whether hot spring was being expelled at the center of the crater or not. In the summer 2013 and 2014 and autumn of 2016 I had seen hot spring was welling there and flowed for around 20 meters. But on this day I saw NO hot spring coming out. But I saw some relics like white spots (gypsum?) and small sulfur crystals in the previous hot spring flow path, so hot spring might have been expelled shortly before my visit but this is only my assumption. Fumarole A-1 expelled volcanic gas. This fumarole does NOT expel vocanic gas while hot spring is coming out. 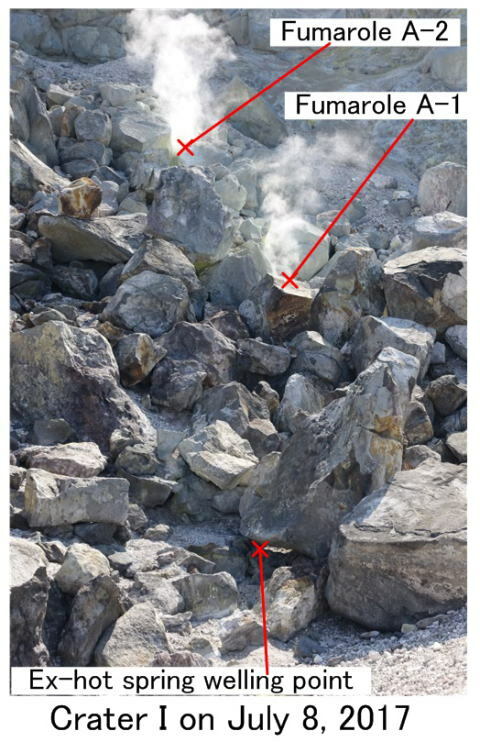 I assume that ground water will close the path of Fumarole A-1 while water level is higher and hot spring is expelled. Fumarole A-2 also expelled volcanic gas. This fumarole always expels gas irrespective of hot spring welling.